Footsteps - Faiths for a Low Carbon Future is part of the Birmingham Council of Faiths. Footsteps brings together faith groups in Birmingham to respond to the challenge of moving to a low carbon future. All faiths recognise the need to care for the planet and God’s creation. Footsteps builds on the efforts of individual faith groups. The multi-faith events that Footsteps has held since its launch in November 2015 have been well attended providing evidence that Birmingham faith groups do want to work together on environmental initiatives. 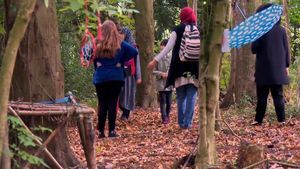 Small Footsteps is a Footsteps’ project aiming to inspire young people from different faith backgrounds (and none) to value the environment which is at risk through climate change. We believe that the best way of doing this is for faith groups to work together in ways that demonstrate deep shared values faiths have for the environment. At the heart of the Small Footsteps programme is the way in which young people are introduced to the environment through practical activities related to food and food waste, recycling, water, trees, energy, the ecological cycle of life and then bringing these together in relationship to how the environment is at risk from climate change. What different faiths say about these different aspects of the environment is woven into the practical activities connecting the environment and faith in ways that, we believe, are innovative and original.